Last month an attack by a lone Kashmiri on an Indian military convoy to avenge the abuse suffered at the hands of Indian security forces almost started a war between Pakistan and India whose forces already confront each other across the Line of Control in the disputed Kashmir region. Due to the brutal Indian repression of the Kashmiris, another such attack is waiting to happen. When it does, yet another spiral of military escalation would start, with no certainty where it would end. This underscores the reality that relations between nuclear-armed Pakistan and India are balanced on a razor’s edge. Deterrence exists when the opponent is convinced that its action will trigger a definite response causing unacceptable level of damage. In a nuclear context, this ensures Mutual Assured Deterrence (MAD) as the basis of credible deterrence. But deterrence is dynamic due to changes in technologies and doctrines. Between Pakistan and India, MAD ensured deterrence after their May 1998 nuclear tests. This deterrence, however, neutralised India’s numerical superiority in conventional weapons, leading to adoption of its “Cold Start or Proactive” doctrine to wage a limited conventional war “under a nuclear overhang” which would restore the salience of Indian conventional forces. Pakistan responded by developing low-yield nuclear weapons mated with the short range Nasr missiles to blunt any Cold Start offensive, as part of its Full Spectrum Deterrence doctrine, deterring India at the nuclear and conventional levels in order to prevent the outbreak of war. This strategy aligns fully with the essence of nuclear deterrence which is that “nuclear weapons are meant to prevent wars, not to fight them”. With the de-escalation of the latest crises, a debate has ensued whether deterrence worked to prevent a full-scale war. To make an objective assessment, it is necessary to separate fact from fiction, especially the hysterical Indian warmongering and false claims. Faced with elections, Modi had to demonstrate a muscular response. He was also encouraged by American statements recognising Indian ‘right of self-defence’. This led to the Indian bombing of an area within Pakistan, and even though it did not cause any real damage, it was an escalation beyond the usual exchanges across the LoC. Yet the Indians were constrained to officially describe their operation as a “preemptive non-military strike” so that they could claim to have acted with restraint, even though their media alleged hundreds had been killed. Pakistan’s response was one of measured restraint demonstrating that Indian military installations could have been destroyed but were deliberately spared. In the ensuing aerial operations, two Indian air force jets were shot down and one of the pilots captured only to be returned as a goodwill gesture. Rejecting Pakistan’s repeated offers for de-escalation and talks, India planned to carry out 6 to 7 missile strikes on Pakistani cities which was aborted only after Pakistan’s threat to respond with a three times stronger missile attack. By then even the Americans realised that India needed to be restrained. Throughout this crisis, India did not implement its Cold Start doctrine which indicates that Pakistan’s Full Spectrum Doctrine policy proved to ensure credible deterrence. India was also careful not to cross Pakistan’s red lines nor was able to use its numerical superiority in conventional weapons to its advantage, even in the limited, short military exchanges. In particular, they could not prevent Pakistan from undertaking a sharp and swift conventional response. Therefore, neither side opted to go up the escalation ladder leading to a wider conflict which could have spiraled out of control. But, unfortunately, the Indians and their friends do not seem to have drawn the sensible conclusion. 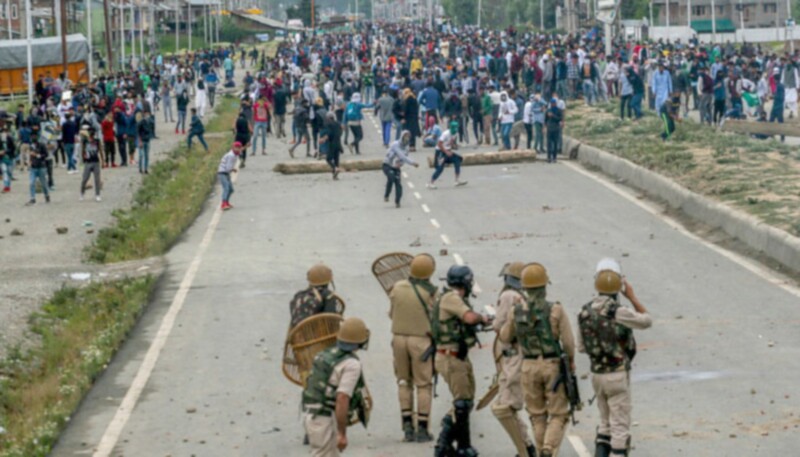 India, with the US, British, and French support continues to focus on “terrorism” as the cause of the crises and not the Kashmir dispute and the gross Indian human rights violations. This is a purblind policy. More dangerously, Indian experts are calling for increased militarisation both in conventional and nuclear domains. An especially perfidious approach is for India to develop the capabilities to launch a pre-emptive nuclear strike to destroy Pakistan’s nuclear arsenal. Ostensibly responsible former Indian officials like national security adviser Shivshinkar Menon, defence minister Manohar Parrikar and Commander of Strategic Forces General BS Nagal, have advocated a “pre-emptive comprehensive counter force strike” to “completely disarm Pakistan of its nuclear weapons”. To do this, they recommend Indian development of Ballistic Missile Defence, Submarine launched Ballistic Missiles, Multiple Independently targeted Re-entry Vehicles (MIRVs), cruise missiles and, for good measure, hydrogen bombs all of which are already under development. But to be assured of the efficacy of these weapon systems, India would need to carry out more nuclear tests. Indian nuclear scientists have already publicly called for more testing. Perhaps that is why India has refused to sign the Comprehensive Test Ban Treaty. Most likely, India is waiting to build up its stocks of fissile material through the facility of the NSG waiver so that it can conduct its nuclear tests when it is no longer reliant on external supplies. This Indian nuclear build-up is taking place with American support, especially development of missile defence and ICBMs, ostensibly to be used against China but can also target Pakistan. Ironically, it is Pakistan instead of India that has recently been blamed by US Secretary of State Pompeo, almost flippantly, of “proliferation” that allegedly threatens American interests. This is inconsistent with even his own Administration’s National Security Strategy which identifies Russia and China as posing a nuclear threat to the US and does not even mention Pakistan in this context. Besides, the US knows very well that Pakistan’s nuclear capability is only meant to deter India. As in the past, Indian military build-up will have to be appropriately matched by Pakistan in order to ensure continuing credible deterrence against India. There can be no unilateral concessions or compromises by Pakistan. Consequently, both countries will continue to exist on the razor’s edge. Zamir Akram, is a former Ambassador who has served as Pakistan’s Permanent Representative to the UN in Geneva.